It’s impossible to think about the Australian bush without bringing to mind the image of Ned Kelly with his gun and homemade armour. 136 years after the last surviving member of the Kelly gang was sentenced to hang, Australians remain enthralled by the romantic tale of this outlaw folk hero, but very few have ever visited the landmark sites where Ned Kelly’s legend was forged. The Kelly Gang were primarily active in a small pocket of northern Victoria, just a little over two hours outside Melbourne. Whether you’re interested in Australian history, passionate about folk law, or one of the many who admire Ned’s larrikin spirit and rebellious nature, there are plenty of historic Kelly artefacts to be found in the townships where he lived his short life. These quiet country towns are clustered together and make the perfect itinerary for a Kelly daytrip, so get together a group of friends, book a coach hire with Melbourne on the Move, and prepare to walk in the footsteps of Australia’s last, and most notorious bushranger. Just 58km to the north of Melbourne is the sleepy town of Beveridge where Ned and his brother Dan were born. The family home which Ned’s father, John ‘Red’ Kelly built from bush materials and local bluestone still stands, as does the local pub (The Hunter’s Tryst) which Red was known to frequent, and the bluestone church where Ned and his siblings went to school. Even at this early stage of Ned’s life, his family name was associated with criminal activity, as his father was an infamous cattle thief and their home was a known meeting place for all kinds of outlaws. Around the back of the Benalla courthouse is a humble cell where Ned Kelly was locked up numerous times as a teenager and young adult. Some of the crimes he was held for include beating and stealing from a Chinese fowl trader at the age of 14, riding a horse drunk down a footpath and then escaping and hiding in a shoemaker’s shop on the way to court, and beating up Constable Fitzpatrick when he came to arrest Ned’s younger brother Dan. The Old Courthouse and Survey Office where Kelly was held and tried are still standing, as is the Old Boot Maker and Saddler Shop where Ned escaped the police on his way to court. Other notable sites in the town include the Benalla Costume and Kelly Museum which houses the green sash which a young Kelly was given as a reward for rescuing another boy from drowning. Somewhat poetically, the sash is bloodstained from being worn around Ned’s waist during the Kelly Gang’s final shootout at Glenrowan. The Benalla Cemetery is also the resting place of numerous Kelly associates and relatives, most notably Kelly Gang member Joe Byrne. At the Benalla Art Gallery, it’s also possible to see Sidney Nolan’s iconic representations of Kelly in his ‘Glenrowan’ tapestry, and Albert Tucker’s painting of Joe Byrne. A small brass memorial plaque marks site of one of the greatest showdowns in Victorian history. Stringybark Creek was the place where the Kelly gang evolved from horse thieves to some of the most wanted outlaws in the Commonwealth, and where the folk legend of the last true bushranger really began. It was here in 1878 that the Kelly Gang had chosen to hide out from the law and where two parties of police were sent to capture them. Instead, the Gang took advantage of the thick bushland ambush the officers camp which resulted in the death of Sargent Kennedy as well as Constables Scanlon, and Lonigan. Kelly always maintained that he only fired in self defence, however a police map made by the sole survivor of the incident suggests that the policemen were shot in cold blood. After the gunfight at Stringybark Creek, the Kelly Gang were denounced as outlaws and took to the bush, but they needed money to stay in hiding. To get these funds, they planned two daring robberies, one in the NSW town of Jerilderie (where Ned gave in his famous letter denouncing the state’s treatment of the poor English and Irish migrant communities), and one in the Victorian town of Euroa. Kelly held up the National Bank using hostages, and got away with £2000 pounds’ worth of money and gold (about $412,500 in modern Australian dollars). It’s still possible to visit the National Bank, and the Faithfull Creek Station where the Gang rested and took hostages before the holdup. The last, stop on the Kelly tour before Old Melbourne Gaol where he was sentenced to hang is the tiny town of Glenrowan, where the Gang had their final siege and showdown with police in 1881. The Gang had come to Glenrowan in an attempt to sabotage the railway track which was being used to transport police reinforcements up from Melbourne. It was here that the Kelly Gang donned their iconic homemade armour and where Gang members Dan Kelly, Steve Hart and Joe Byrne lost their lives. Although it’s possible to visit the site, the Glenrowan Inn where the gang took hostages was burnt down by police on the night of the siege. The original railway platform, which served the track that the Kelly Gang sabotaged is still intact. 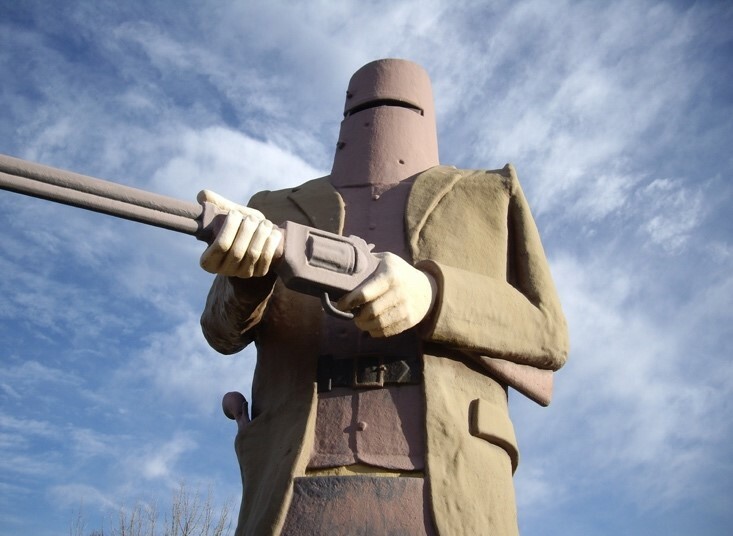 Other sites of interest include the Ned Kelly Memorial Museum and a six-metre-high statue of Ned in his armour.